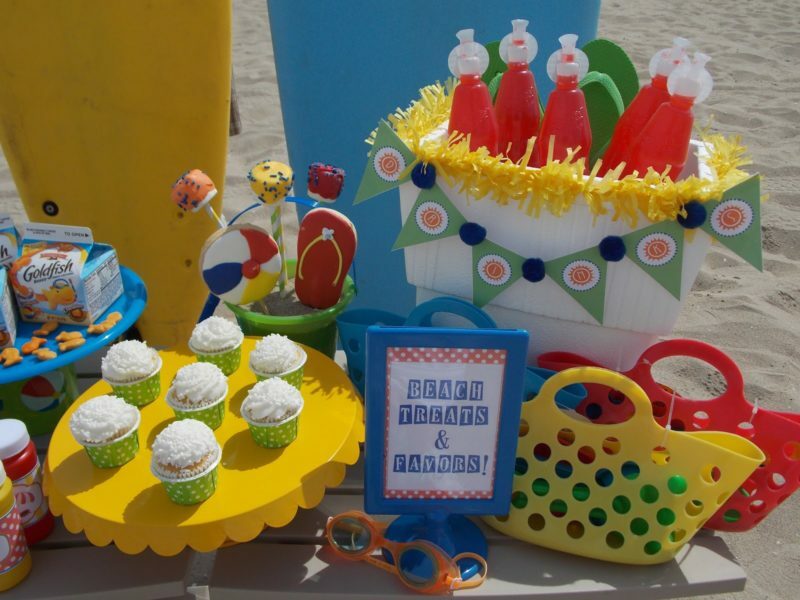 Today Laura of LAURA’s little PARTY is sharing with us this darling party she threw her kids at the beach to kick off summer. 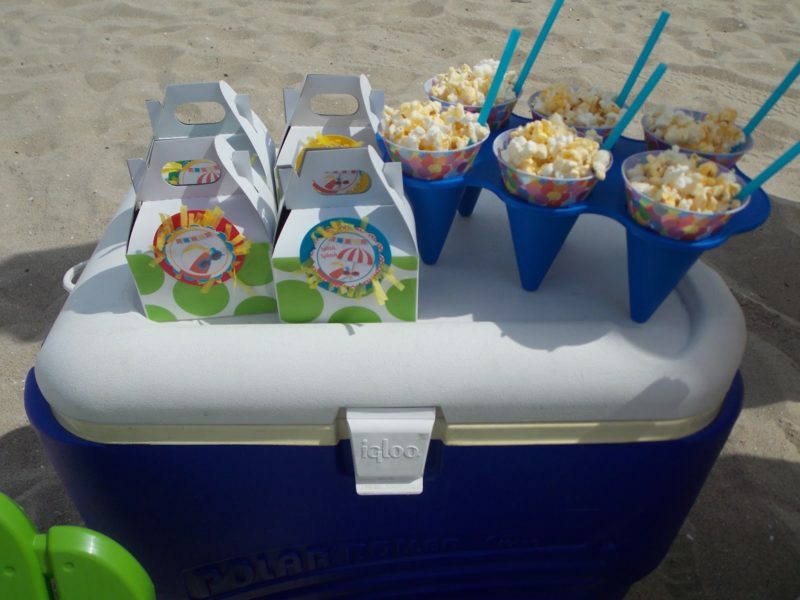 How stoked would you have been to have this set up at the beach?! Laura thought of everything. She is crazy talented and I firmly believe her little bun in the oven (due any minute now by the way) is actually an Energizer Bunny! I’m going to turn it over to Laura to tell you about her little beach bash. 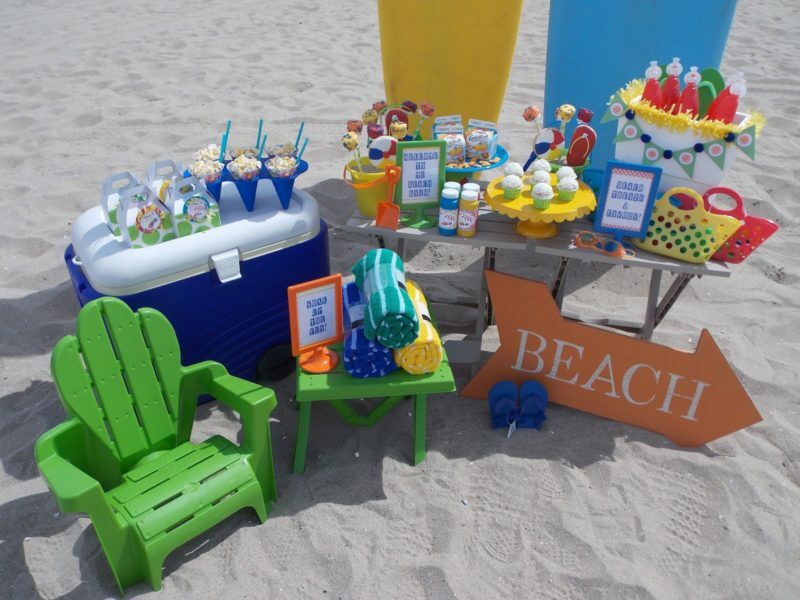 Laura says, “When I think of summer fun, the beach automatically comes to mind! I love finding reasons to celebrate. And I usually find the most simple things that will trigger a party idea. But what I love most about creating parties, is when I inspire others to do the same! 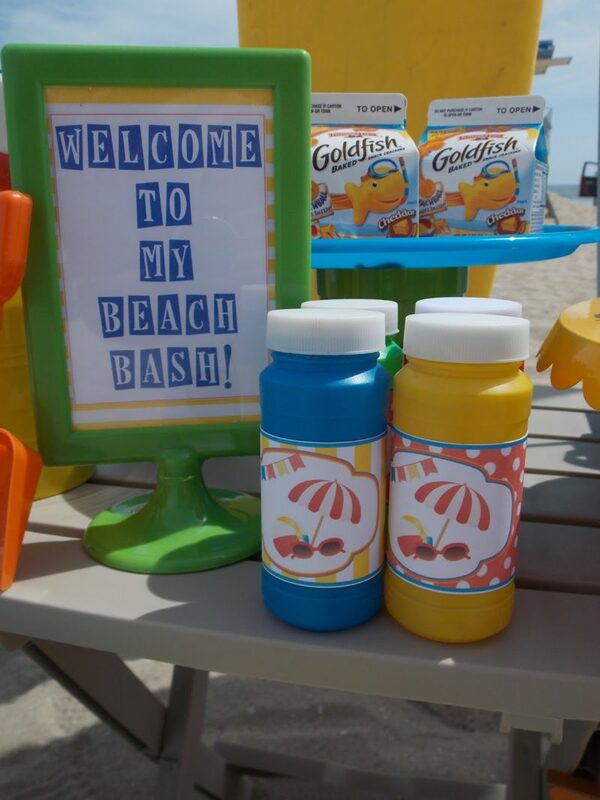 My toddler-friendly beach bash has easy treats, and fun favors, all while keeping a close eye on the check book! I wanted to make my beach party as simple as possible. That meant simple decor, and easy party props. 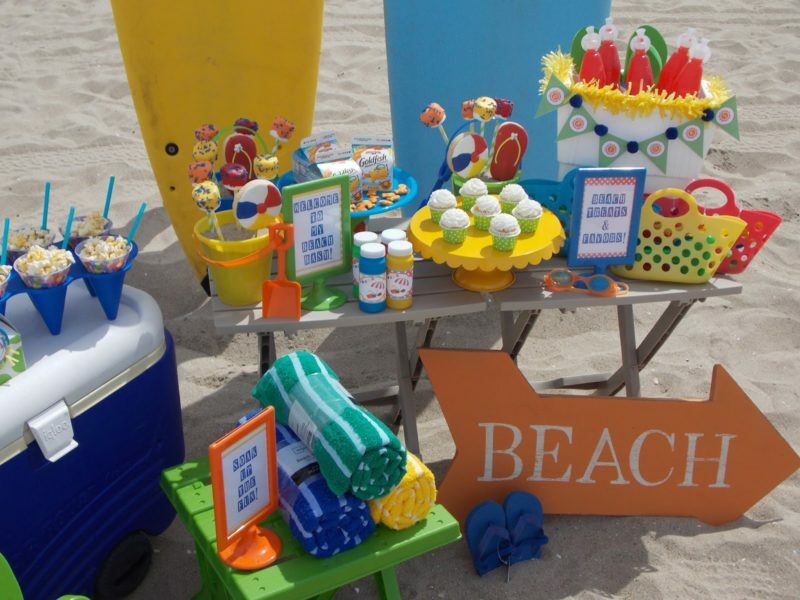 I used 2 surfboards for my backdrop, brought collapsible tables, and even used my ice chest to transport the treats, and display them! Every toddler-friendly bash calls for toddler-friendly treats! Simple chocolate dipped marshmallows, and fish crackers. Of course the marshmallow pops were a hit with my little guy. I found a really cute ice chest at the 99cent store. I knew it would be perfect for the bash! I embellished it with paper fringe, a small banner, and Kool-Aid drinks. 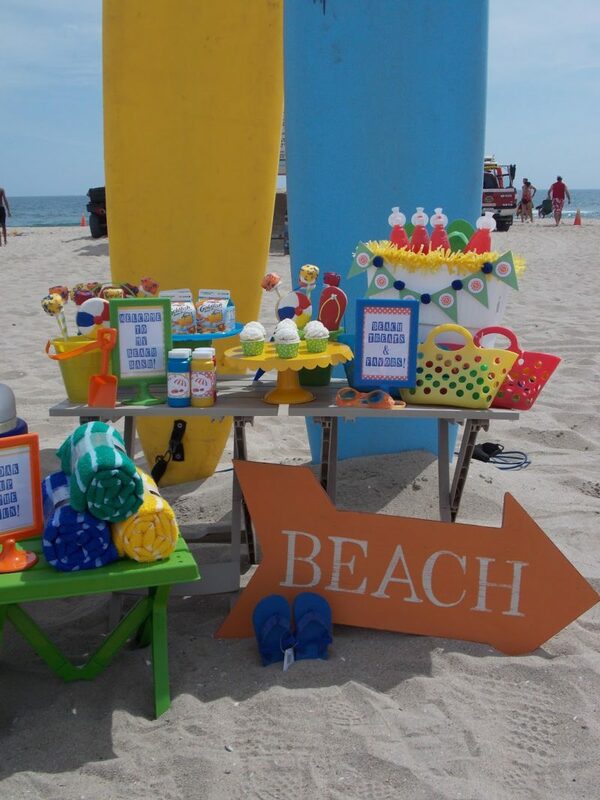 I also found small beach totes filled with beach toys, and used them as party favors. Bubbles are always a party-must! I picked these up from Dollar Tree, and added some festive printables, from Whimsically Detailed. My ice chest worked perfectly as a display table for more treats & favors! I filled snow cone cups with popcorn. Perfect for little fingers. And look at the darling mini favor boxes! I purchased them from Piggy Bank Parties. I added my own embellishments: paper fringe, polka dotted paper, and more cute printables from Whimsically Detailed. The surfboards worked perfectly for a festive backdrop. And I fell in love with the wooden “Beach” sign from HomeGoods. 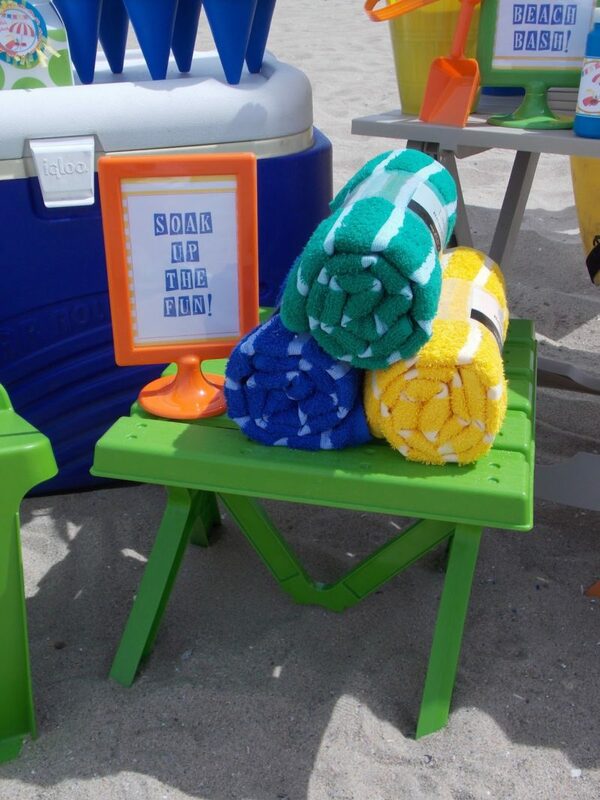 Beach pails, totes, flip-flops, and towels completed the decor! Are you ready to head to the beach now? I’m bringing Laura because she clearly knows how to party at the beach! Thank you so much, Laura, for sharing your party with us. Wow is all I can say. Another beautifully done party from LAURA’S little PARTY! If you would like to get in touch with Laura or follow along her party journey to find some inspiration you can find her on Facebook, Instagram, or Pinterest.